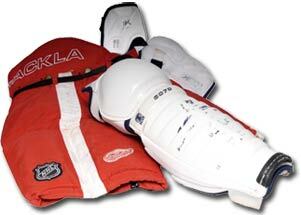 worn by Brett Lebda of the Detroit Red Wings during the pre-skate on Steve Yzerman's number retirement night on January 2, 2007. Steve Yzerman of the Detroit Red Wings during his final NHL season in 2005-06. 2002 Winter Olympic Games and 1998 Winter Olympic Games. 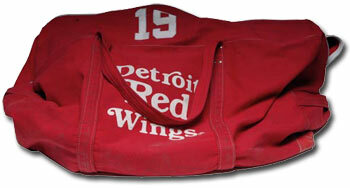 Detroit Red Wings hockey bag used by Steve Yzerman during his final career NHL season in 2005-06. 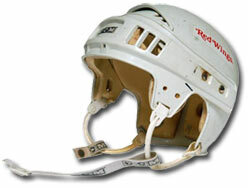 Helmet worn by Steve Yzerman throughout the 2005-06 NHL regular season and NHL playoffs. 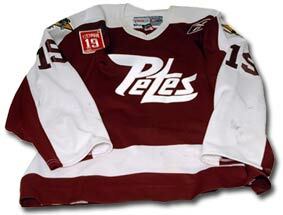 along with a commerative stick from the 1990-91 NHL season.